Another piece for my Own Magic Card Project finished. This card image is the second one completed after my previous image Swamp. Like always, I started with some small thumbnails. You can do these in black and white or in color. I prefer working directly in color, otherwise, when I have to add color later on, it looks too Photoshoped for me. Try both ways and find out what works the best for you. There is no good or bad way. To improve your working speed, it’s a good idea to place your different thumbnails on the same canvas or even in the same working file. That way, you can work on them simultaneously. It’s easier to color pick and even use the clone tool to make some nice feeling of textures while cloning. 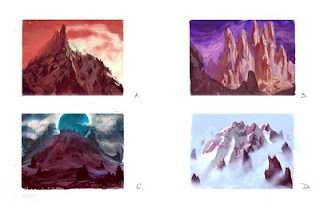 The thumbnails I created looked fairly boring and they didn’t had the red color for which mountains stand in Magic. 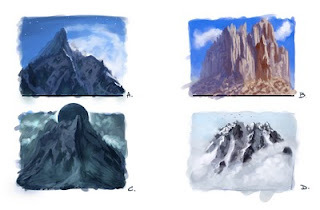 People were correct when they noticed that the mountains looked too peaceful. I changed the color palette and refined the thumbnails more. At that stage, we decided to drop image B, C and D and concentrate on A more. I didn’t want to go too dark with this one so I decided to go for a mid to low value range. I wanted to convey the feeling of the last warm sun rays peeking over the far mountains tips with a cold mountain wall in the foreground. 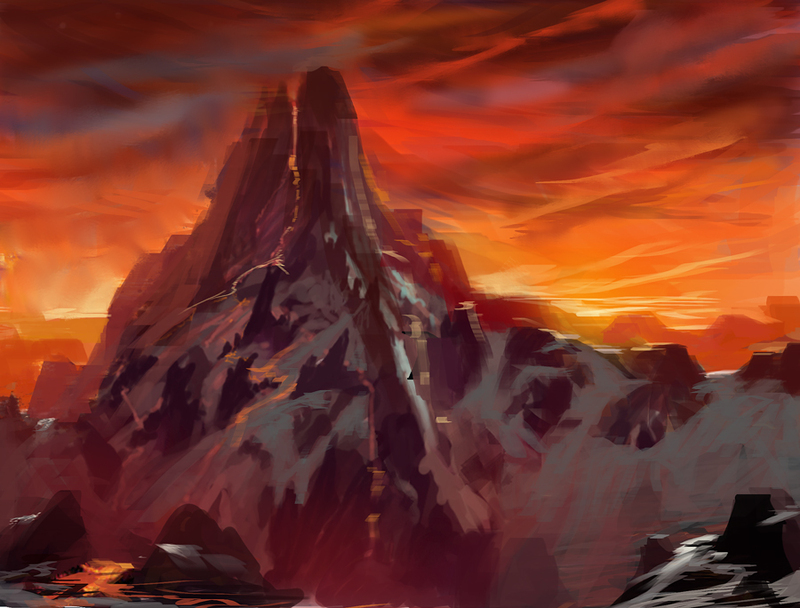 Once the mood was more of less decided, I needed to revisit the shape of the mountain. It looked pretty boring. I created three versions with each a different horizon line. I quickly decided that the blue hue of the mountain would work the best in combination with the red sky but I had some difficulties getting an interesting image. I liked the mountain top and sky of image A but also liked the idea of the columns rising out of the mist in image C. We decided to combine them in one new image. Once those problems were out of the way, it was time for me to make two small variations of the image. Both looked good and were interesting enough to work out so I had the opportunity to chose the one that I liked the most. At first I thought the first version would be the best because of the extra point of interest in the foreground and it had some great lighting possibilities. In the second image, I had the feeling the balance wasn’t right. There was more focus on the fog and sky then on the mountain. 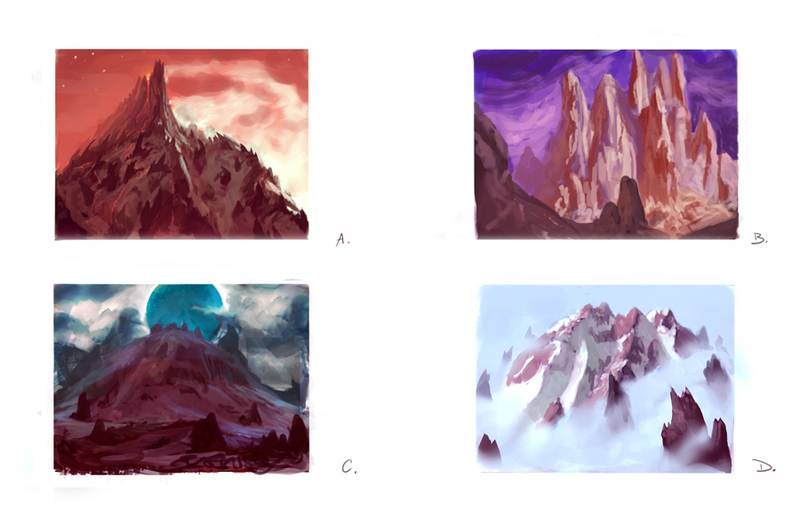 I went for the second one though because I realized the other image was too straight forward (bam Mountain!) and I would be able to change the focus of the second image by changing the values and adding more details. That brings us to the following. As an artist you can decide where you want the viewer eyes to rest in your image. You can chose between the masses of light or shadow. By adding more details in the light masses, the viewers eyes will automatically look at that area and the mass shadows will be more simplified. It also works the other way round, like I did for this image. If you decide to add details in the mass shadows, keep your mass lights simplified. Otherwise, your painting will have very busy feeling to it. Same thing is happening in real life. If you take a look at a highlighted area next to a shadow, the highlight will contain all the details and the shadow will be simplified. If you however take a look at the shadow now and let your eyes adjust, the shadow will be detailed and the highlighted area will be simplified. So I started working on my big masses of light and shadows first. Keeping the mass highlights fairly simplified and the mass shadows detailed. We decided that the Aurora feeling in the sky was pretty cool so I strengthened that feeling. A happy accident happened and I developed a peeking hole to the stars in the sky. I also tried to make some other ‘windows’ in the painting to ‘peek through’. I marked them with the rectangles. 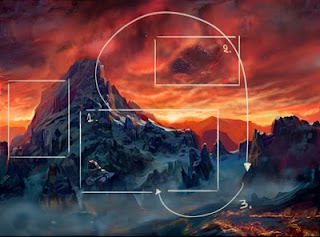 The image also shows the three reads I want to accomplish with the painting. By pushing the saturation around the borders of the masses of light and shadow, I was able to reinforce the feeling of cool shadows versus warm highlights. Sorry that I never answered your comment on my blog! That was back in march, I wanted to answer you but I never dd, sooo sorry haha! So thank you very much for the link, it helped me indeed 🙂 I haven't drawn for a long time but I'm getting back into it! Hey David, no problem man :)! Thank you for the kind words, it's great to hear you like it so much :)! This is really impressive! I think this is easily one of your strongest pieces. I really admire how worked out multiple solutions rather than settling for the first answer. I can learn a lot from you!